Kerala is an Indian state located on the south-west India wedged between the Arabian Sea to the west and the Western Ghats to the east. 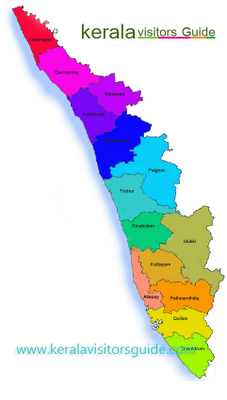 Kerala’s coast runs nearly 600 km in length, while the width varies between 35–120 km in width. There are 14 districts in Kerala with Kasargode at the northern end and Thiruvananthapuram at the Southern end with Thiruvananthapuram serving as the Capital city of the state. Names of these 14 districts (and their older English Version) are given below. Districts are again subdivided into Taluks and then Villages.